CONVENIENT SIZE – Our universal pram cup holder is suitable for all kinds of baby bottles,drinks bottles and coffee cups. The stroller cup holder set includes 2 High Quality buggy clips to allow you to free your hands when shopping or travelling. FIRM GRIP – Our baby cup holder for pram has a extra strong clip, especially designed to fit on all types of baby strollers bars or wheelchairs. Soft rubber on the clip to prevent scratches on your stroller pushchair. FLEXIBLE AND STABLE – Can be installed in all different positions (360 degree turn) on any baby pram. On the inside of the holder we designed 3 bendable clamps to insure your baby bottles and coffee cup will stay stable even on a bouncy road. 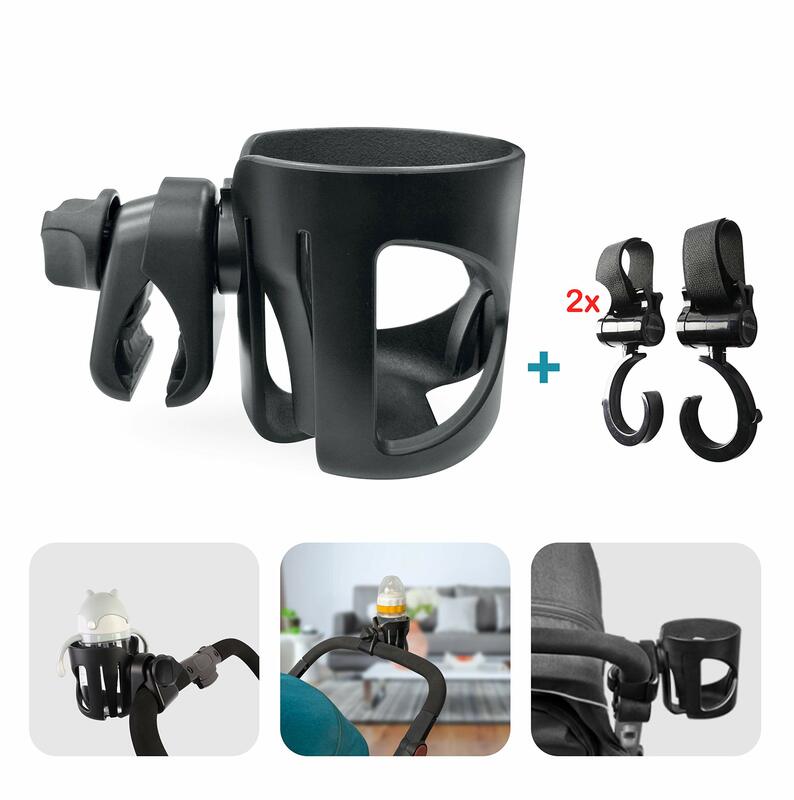 that attaches the stroller cup holder to the handlebar of the baby carriage, our Buggy, pram,Topist ,Weelchair cup holder stands straight and has a very strong Grip, to prevent any liquid of spilling. 2 high quality buggy clips,These Pram clips are especially designed to make it easier and more pleasant with your shopping and travelling. Imagine going to the park and placing all your shopping on the stroller hooks, Super convenient bag hooks, you will love this stroller organizer set. No handyman needed 123 and its on your buggy! UppaBaby cup holder,Mclaren cup holder,egg pram cup holder,walker,electric wheelchair cup holder,Cosatto,Stokke, and almost every stroller handle. You will not need any tools. TWO PRAM CLIPS – These buggy clips are a life saver for every young mother, no more braking your back carrying all your shopping bags,nappy bag, just clip them on these pushchair clips. EASY INSTALLATION – You can install our buggy cup holder and buggy clip on any baby stroller super quick and easy no tools needed. Our set is very adaptable so you can install it on most leading brands,Bugaboo cup holder,UPPAbaby,McLaren,yoyo and almost every buggy.